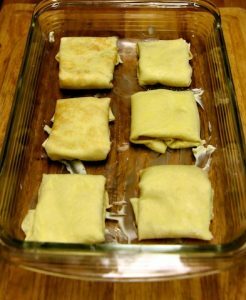 Blintze: a thin pancake folded or rolled around a filling, as of cheese or fruit, and baked with lots of butter and cream. Served with jam, marmalade and sour cream for breakfast or afternoon treat with hot chi. Family tradition as old as the season. Auntie Shirley left me several of her cookbooks. 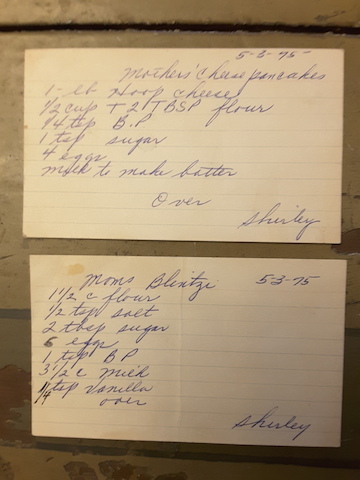 I was looking through one of them for her sour cream cookie recipe when these two recipe cards fell out. Mother refers to Grandmother Hazel Uraine who was famous for her magical stories especially her adventures crossing through Panama from Azerbaijan through Russia and France before finally making her way to Los Angeles in the early 1900’s. I’m glad she repeated that story so many times because now I remember it. I’m also fortunate to have watched her make those wonderful blintze, pounding the stove with that iron skillet and scattering batter even onto the walls. What a nice family remembrance. Mix flour, sugar, salt, baking powder. Heat milk, slightly-beat eggs and pour milk over eggs-add slowly to flour mixture finish by beating with egg beater for smooth batter, not too heavy. Have skillet real hot-grease pan and bake. Mix flour, sugar, salt and baking powder (optional) in a bowl. Heat milk to warm, not boiling. In a separate bowl, beat eggs. Gradually add the warm milk over eggs, beating constantly. Add the egg mixture to the flour mixture gradually to prevent lumps. The batter should be smooth and thick like cream. *Heat a skillet until hot. Wipe with oil. Pour ½ ladle of batter into skillet. Twist the skillet handle in your hand so the batter will spread evenly. Turn the blintze over for ½ minute until golden brown. Place blintze on clean white cloth for cooling separately. When cooled, fold in half and stack. 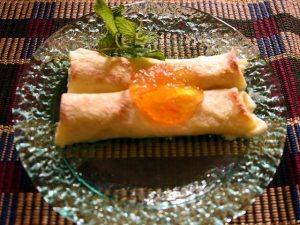 I use the following recipe with my electric blintze/crepe maker which cooks the blintzes without having to use a skillet. However, the crepes don’t brown as nicely. Softened, unsalted butter or vegetable oil for brushing crepe pan. Make Batter: Mix flour, sugar and salt in a bowl. In a separate bowl beat eggs thoroughly, and add milk, oil, and vanilla. Mix until smooth. Add to dry ingredients, beating until the batter is smooth (consistency of cream). Cover with plastic wrap and allow to rest for 30 minutes or overnight in refrigerator. Bring back to room temperature before cooking. 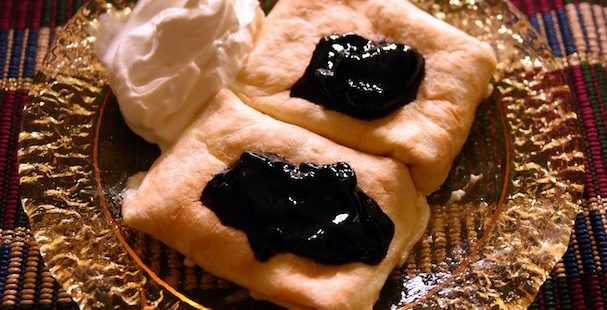 Make blintze in a prepared skillet* or use electric appliance. After the blintze have cooled, take each one and fold over two adjacent sides, about a third of the way. With the side nearest you, begin rolling into a cigar shape. Place seam side down in a buttered dish. Dot with butter, add milk, half and half or cream to just cover the bottom of the dish. Bake at 350 degrees for about 20-30 minutes. Color should be lightly browned. Sprinkle with confectioner’s sugar for a simple dessert or serve with jam, marmalade, and sour cream, fruit or even ice cream. Though I prefer my blintze without a filling, I’ve included two fillings, the first has been tested and approved over the years through the kitchen circuit, going back to wood cook stoves and the second, an updated version. Most of the recycled recipes for blintze ask for hoop cheese which is difficult or impossible to find. Drained, small curd cottage cheese is the closest substitute I’ve found, ricotta a second. Armenian, Jewish or Russian specialty stores in your area may still carry the real thing. The last time I found hoop cheese was in a Whole Foods store. Break up hoop cheese with a fork. Beat eggs slightly; add to cheese. Add sugar and salt. Mix well. Spread about a full tablespoon of cheese mixture on blintze. Fold side nearest you to cover cheese mixture. Then fold sides to retain fill and roll. Dot each blintze with butter and bake in buttered oblong pan about 20 minutes in a 350 degree oven. Beat cheeses together, add sugar, salt and lemon zest. Beat in one slightly beaten egg. Mix well. Assembling Burrito Style fold: Lay blintze on a flat surface. Fold one side towards the center. Fold the other end over, not touching. Roll the bottom (the end nearest you) up towards the top. Continue rolling creating a cigar shape. Place seam side down in prepared glass or casserole dish. 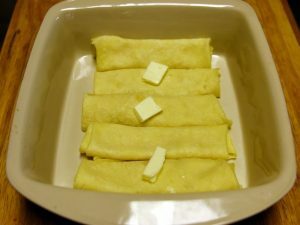 Bundle style: Place 2 tablespoons of cheese mixture down the middle of each blintze. Cover the filling by overlapping the two sides of the blintze. Fold up the side nearest to you. Then fold top down to cover. Flip over and place seam side down in glass or casserole dish. Baking: Place the blintze in a well buttered dish. Dot with butter and add cream, half and half or milk, about 1 cup. Bake at 350 degrees for 20-30 minutes. ← What is the shelf life of a lemon?